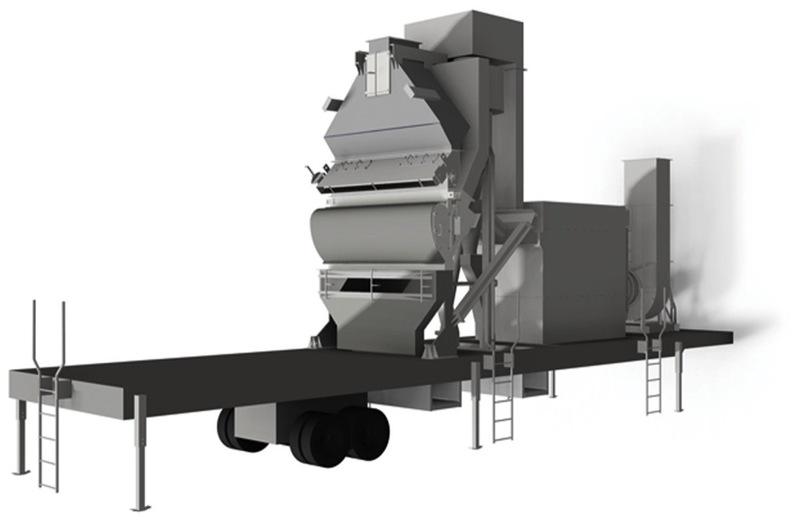 Lebanon (PA), United States – Process equipment manufacturer Van Tongeren America has unveiled a mobile version of its innovative dry particle classification system that separates materials on-site without requiring water. Developed for processing manufactured sand, frac sand, crushed stone, cement, gravel, lime and other materials, the new, mobile classification system sets the entire processing plant within a standard truck base. This permits convenient movement among multiple sites and to make small or remote locations viable where constructing an entire plant would be cost-prohibitive or where water is not readily available. The mobile classifying system integrates the company’s proprietary Gravitational-Inertial Classifier (GIC) system for particle separation and recovery with its Multicell cyclone system for safely managing exhaust gas at such high particle efficiency that ancillary baghouse dust collectors and precipitators may be eliminated. The pneumatic air classifier separates particles at any cut point from 300 μm to 63 μm (50 to 230 mesh) and consistently runs unattended in 24/7 operation with no moving parts for dependable service and virtually zero maintenance. Custom conveyors and other accessories may be added as needed.